The Punjab Cabinet has gone all out to appease various categories of employees and backward classes. This includes extending the scheme of allotting 5 marla plots free of cost to homeless and landless persons belonging to all other categories, including backward classes, on the pattern of the SC beneficiaries in the rural areas. For an alternative approach road to the IAS-PCS Cooperative Housing Society that owns about 100 acres of land in Mullanpur and Shingariwala villages here, the Punjab Housing and Urban Development Department seems to be playing to the tune of the society that has many senior bureaucrats as its members. Food and Civil Supplies and Information Technology Minister Adaish Pratap Singh Kairon today said the Food & Civil Supplies Department had initiated a scheme to ensure transparency in the atta-dal scheme by involving people in the pubic distribution system. Even as the then Akal Takht Jathedar Joginder Singh Vedanti had issued directions to the SGPC way back in 2000 to frame guidelines regarding appointment, removal and working sphere of jathedars of all five Takhts, the "mini-parliament" of Sikhs has failed to make any headway in this direction. The Shiromani Akali Dal (SAD) leadership appears to have pulled out all stops to make tomorrow's rally here a success. A visit to this hitherto unknown village found hundreds of SAD activists engaged in making last-minute arrangements at the venue, which gave the look of a mini township. The alleged misuse of government machinery for making arrangements for the SAD’s rally at Kili Chahal village in Moga tomorrow may go unnoticed as Chief Secretary SC Agrawal has said he would not be able to take any action unless directed by the Election Commission. Ridiculing Deputy Chief Minister Sukhbir Badal for seeking proof related to the alleged misuse of official machinery for tomorrow’s Moga rally, Punjab Pradesh Congress Committee president Capt Amarinder Singh today challenged the SAD president to hold such a rally once the election code of conduct came into force. 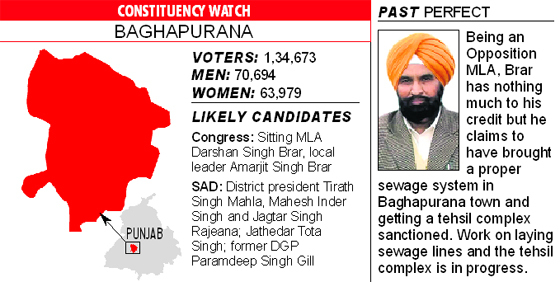 The Baghapurana assembly constituency in Moga district is likely to witness a direct contest between the ruling SAD and the Congress. Sitting Congress MLA Darshan Singh Brar, frontrunner for the party ticket, is looking forward for his re-election banking on the anti-incumbency factor and his personal touch with the people. The BJP will contest the coming assembly elections from 23 seats and would announce its candidates the month-end, said party’s Punjab affairs incharge Shanta Kumar during his visit to the holy city today. 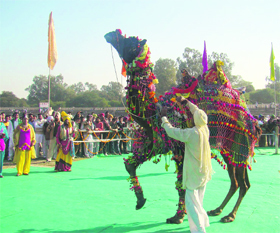 Civil and police administration has geared up to manage traffic on the national and state highways almost in the entire state, including the main link routes in Moga, Ferozepur, Barnala, Faridkot and Ludhiana districts, for the ruling SAD’s “mega” show of strength at Kili Chahal village tomorrow. Even as the police has initiated the process of physical verification of arms in the state, the Congress has alleged that a large number of Akali workers have procured arms licences this year. From schoolgirls to housewives, Punjab is facing a serious problem of anaemia, which is more prevalent in the women folk. With these words, Minister of State for External Affairs, Preneet Kaur, has said that she is extremely pained to notice that women in almost all the villages are having iron deficiency. Punjab policemen ranking from constable and above, having almost 75,000 votes, will be able to exercise their right to franchise through postal ballot. Over 13,500 teachers working under the Sarva Shiksha Abhiyan (SSA) and Rashtriya Madhyamik Shiksha Abhiyan (RMSA) across the state will now get 15 annual casual leaves as against the earlier 10. A 29-member delegation of the World Bank, headed by Elizabeth Kleemeier, USA, Shamil Sarkar, Task Team Leader, World Bank India, Dr Kurian, Netherlands, Abul Kaivm, Muhammad Shamsul Huq Bhuiyan and Mohammad Saifur Rahman from Bangladesh along with officers of different States of India, visited Manhera Jattan village to take stock of the 24-hour pure drinking water supply being provided by the Gram Panchayat Water Supply and Sanitation Committee (GPWSC). Patients coming to Government Rajindra Hospital, Patiala, are in a fix as the lab technicians are on strike for the past five days. As a result, no tests are being done in the hospital and patients are forced to go to private laboratories, which are charging 10 to 20 times more money than the government hospitals. The Consortium of Indian Farmers' Association (CIFA) is mobilising Members of Parliament (MPs), both in the Lok Sabha and the Rajya Sabha, on the issue of immediate reforms in the agriculture sector. With farmers in the state resorting to all sorts of tactics, including dharnas, to protest against the state government's alleged injustice against them, the financial situation of the farmers and land tillers has gone from bad to worse. With the hike of Rs 50 announced in the MSP this year, the input cost has increased manifolds due to increasing prices of numerous commodities. With the Election Code of Conduct likely to come into force anytime in the state, employees of the Health and Family Welfare Department and Department of Medical Education and Research, including PCMS doctors, lady health visitors, pharmacists, multipurpose health workers, nurses, junior doctors and lab technicians, alleged that the government was deliberately causing delay in accepting their demands and waiting for the result of the 2012 assembly elections to decide over this issue. The sale of land measuring five bighas and two biswas by the Sirhind-Fatehgarh Sahib Municipal Council through auction for Rs 1.14 crore has come under a cloud. Indian technical institutions are desperate for foreign tie-ups, whereas students look desperate for migrating to foreign countries, said Dr Hema Sharda, Director, South Asia Relation, University of West Australia, while addressing the delegates on the 2nd day of 41st annual convention of the Indian Society for Technical Education here today. In its meeting today, the Cabinet, however, rejected a proposal to enhance the retirement age of Punjab Civil Services Medical Service (PCMS) doctors from 58 to 60 years. Chief Minister Parkash Singh Badal categorically rejected the demand to raise the retirement age as had been done in case of medical college teachers. The decision puts a seal on similar demands by various employee organisations. The PCMS Association was divided on the issue. The demand was being supported mainly by those nearing retirement while those having a long service period left were opposing it. Dr Hardip Singh, president of the association, said a majority of the doctors had welcomed the decision. Meanwhile, the cabinet regularised the services of 132 lecturers, librarians and workshop superintendents working on a contractual basis for the past three years or above in the Technical Education Department. The Cabinet gave ex-post facto approval to regularise the services of 8,951 employees, including clerks, drivers, pump operators, sanitary workers/sewer men and sanitation workers under mohalla sanitation committees etc. working in 141 local bodies for the past several years. This decision would entail a financial liability of Rs 180.57 crore. It also approved to upgrade Nushera Pannuan and Harike in Tarn Taran district and Balianwali village in Bathinda district to sub-tehsils. The Cabinet also gave its nod for the creation of requisite posts in the newly created sub-tehsils. Further, the cabinet approved the enhancement of old-age allowance to pensioners/family pensioners over and above the recommendations of the Fifth Punjab Pay Commission. The pensioners on attaining the age of 70, 75, 80, 85, 90 and 95 years would now get a higher old-age allowance at the rate of 10 per cent, 15, 25, 35, 45, and 55 per cent of their basic pension, respectively. A new stage for the enhancement of old-age allowance at the age of 70 years has been introduced for the first time. To revive the cooperative sugar mills at Patiala, Tarn Taran and Zira, the government has decided to invite tenders on built, own, operate and transfer (BOOT) basis. The Cabinet also decided that in case of the death of an employee, enhanced family pension will now be payable for 15 years or till the deceased employee would have attained the age of 65 years, whichever is less. It gave ex-post facto approval to regularise the services of computer teaches recruited by the Punjab Information and Communication Technology Education Society (PICTES) from July 1, 2011. The Cabinet also extended the last date i.e. December 31, 2011, by another five years till December 31, 2016, regarding the facility of 5 per cent reservation to the riot/terrorist-affected families for the allotment of plots/houses in the urban estates/improvement trusts/Pepsu Township Development Board etc. without granting any concession in the rates of the plots/houses. 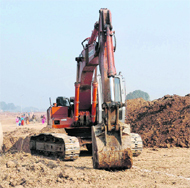 As if 95 feet wide approach to the society from the Chandigarh-Mullanpur road was not enough for the project, the Housing and Urban Development Department had showed urgency in acquiring about 13 acres for constructing about 2-km long road that would pass through inhabited area of Shingariwala village, provoking a strong protest from the landowners who are being displaced. Sources revealed that the housing department changed the alignment of the alternative road that passes along the Pherni village. "To facilitate the society, the government is displacing us despite the fact that we are living here for the past 30 years and our livelihood depends on the land", said Surinder Kaur, one of the affected landowners. "Instead of taking the road through uninhabited areas, the department is acquiring land on which several houses stand," she said. Despite representations to the Land Acquisition Collector (LAC) of the Greater Mohali Area Development Authority (GMADA) regarding their rehabilitation under the land acquisition policy, the concerned official gave no reply. "The LAC personally came to the village to convince the landowners to give their consent for the land", said Surinder Kaur. The Chief Administrator of GMADA, Sarvjit Singh, who is also an office-bearer of the IAS-PCS Officers' Society, said the road was to be constructed by the GMADA as per the master plan and the society had already deposited the requisite external development charges (EDC) with the department. The Punjab and Haryana High Court has granted interim stay on the acquisition proceedings by the Punjab Housing and Urban Development Department to acquire land for the alternative road to the IAS-PCS Cooperative Housing Society. The petitioners, Bhajan Singh, Vinod Kumar, Bikramjit, Resham Singh and Surinder Kaur, in their petition stated that the land being acquired for the second road did not serve any public purpose and was displacing them of their livelihood. Food and Civil Supplies and Information Technology Minister Adaish Pratap Singh Kairon today said the Food & Civil Supplies Department had initiated a scheme to ensure transparency in the atta-dal scheme by involving people in the pubic distribution system. The people can now track the movement of PDS food grain on from storage points to wholesale distribution points on the Internet. Kairon said now anyone can track the movement of vehicles carrying PDS and other supplies right from the storage point to the public distribution wholesale points. He said each truck had been put on GPS (global positioning system) enabled devices that can track the movement of truck so that any attempt of pilferage could be detected. The minister said any deviation from the sanctioned route could be tracked on the GPS. He said anybody could access the website www.trackmaster.in and feed the user name "attadal" and password "transparency" and for kerosene the user name would be "kerosene" and password "transparency" to track the movement of vehicle. Kairon said the department had been providing atta, dal to 16 lakh beneficiaries throughout the state, who were getting 35 kg of wheat and 4 kg of dal and it was the largest ever distribution network of PDS that was working successfully for the past five years. Vedanti had directed the SGPC to appoint a committee of Sikh intellectuals for fixing duties, responsibilities and qualifications for the appointment of high priests. These directions came in the light of criticism of the Akal Takht in dealing with panthic crisis during that period. The move was also preceded by unceremonious removal of Vedanti's predecessors Bhai Ranjit Singh and Giani Puran Singh from the key post. 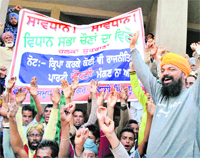 Though the SGPC didn’t take any initiative even after the then Akal Takht Jathedar’s directions in this regard, radical Sikh outfit Dal Khalsa has made various attempts in the past to highlight the issue and even prepared the blueprint regarding the appointment, removal and working sphere of the Takht jathedars in consultation with representatives of various Sikh organisations and intellectuals. Dal Khalsa leader Kanwarpal Singh said the jathedars were leaders of the Sikh community who were expected to conduct their lives in an exemplary fashion. However, this is not the case now for which the Dal Khalsa places the blame on the increasing political interference in religious affairs. ‘‘Whenever political considerations have taken precedence over religious ones, whether it was in the British period or in recent times, the Takhts have been involved in controversies,’’ he said, adding that the Takht jathedars should enjoy confidence of the entire Sikh community. Deputy Chief Minister and SAD president Sukhbir Badal has claimed that the rally would be the "biggest ever" not only in Punjab but in Asia. Yellow flags having Chief Minister Parkash Singh Badal and Sukhbir Badal's photos could be seen tied on trees along the highway leading to the village, situated on the Moga-Ludhiana highway, about 12 km from Jagraon. Two large 'pandals', which the Akali leadership claimed had the capacity to accommodate around 7 lakh people, have been set up. A helipad has been prepared across the highway for the landing of helicopters of bigwigs like Parkash Singh Badal and Sukhbir Badal. Sukhbir along with his brother-in-law Bikramjit Singh Majithia flew in today to take stock of the arrangements. He visited the sprawling 'pandals' over the agricultural land and the dais and minutely checked the arrangements that have been made for the participants who were expected from across the state. "It seems a separate city has been carved out from Moga. People are coming in huge numbers; the count may exceed our expectations. We have made special arrangements for their overnight stay too," Sukhbir said while speaking to The Tribune at the rally venue. Training guns at the Congress, he said, "See the number of people who have been engaged in making arrangements here. This is more than the total number of participants at Congress rallies." Towards the evening, jam-packed buses of party supporters, too, started reaching the venue where they were welcomed with a 'langar' and were also provided quilts and blankets. 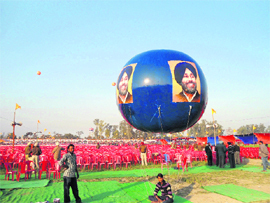 Four jumbo sized balloons with portraits of both the Badals were in the air. A number of parking lots have also been created on the highway for the rally. Agrawal said he was not aware of any misuse of government machinery. “I do not know about any diversion of official machinery in Moga. I will ask the officials posted there to send a report, if the EC asks for it. It is up to the Election Commission,” he said. Chief Electoral Officer Kusumjit Sidhu, on the other hand, said she could not do anything as the code of conduct was not yet in place. “I can step in only after the code is implemented. As of now , it is up to the government to take action. As per rules, the Commission cannot intervene in such cases till the code is implemented,” she said. Government officials in Moga have been on their toes to make the rally, dubbed as “Asia’s biggest” by Deputy Chief Minister Sukhbir Badal, a success. Moga District Magistrate Ashok Singla and SSP Sneh Deep Sharma, besides other senior officials, have been overseeing the arrangements by visiting the site on a daily basis. Singla had even postponed a couple of official meetings to ensure his presence at the rally. “You don’t require proof for things which have already been established independently,” Capt Amarinder Singh said while pointing at media reports along with visuals as to how officials were being “directed, dictated and coerced” to mobilise crowds for the rally. Amarinder said the entire police set up and the bureaucracy was in regular touch with him and they have been briefing and updating him about each and every development taking place within the government. “So better keep quiet and forget asking for the proofs, lest we reveal more than you know about yourself”, he advised Sukhbir. Challenging Sukhbir to hold the rally after the imposition of the election code of conduct, the former CM said that the government officials had been told to report at Moga and mark their presence there, besides getting people along with them. He claimed 40,000 police personnel had been deputed at Moga to “swell the crowds” for the rally. “Otherwise, what for do you need such a massive posse of cops,” he asked. Amarinder claimed that police personnel, including jail staff, and government officials from across the state had been told to report at Moga and attend the rally in a bid to swell the crowds. Besides independent media reports, he said, the very fact that the rally was being organised before the imposition of the election code of conduct was enough proof that it was more of a “government-sponsored show than an Akali rally”. The Baghapurana assembly constituency in Moga district is likely to witness a direct contest between the ruling SAD and the Congress. Sitting Congress MLA Darshan Singh Brar, frontrunner for the party ticket, is looking forward for his re-election banking on the anti-incumbency factor and his personal touch with the people. 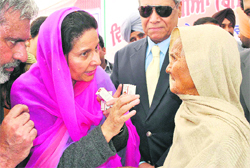 Brar remained Chairman of the Punjab Agro Industries Corporation from 1992 to 1995 and then a minister in the Harcharan Singh Brar and Rajinder Kaur Bhattal governments in 1996-1997. Another local Congress leader Amarjit Singh Brar has also applied for the party ticket. 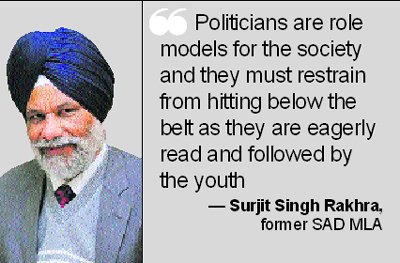 He has the backing of Congress Working Committee member Jagmeet Singh Brar. Among the Akalis there are three main contenders for the party ticket: the SAD district president Tirath Singh Mahla, Mahesh Inder Singh and Jagtar Singh Rajeana. But the party leadership may spring a surprise by fielding senior party leader Jathedar Tota Singh or former DGP Paramdeep Singh Gill. The two have already started campaigning in the nearby Dharamkot and Moga constituencies, respectively. The government has not taken any major initiative to bring in industry and provide jobs to the local youth although government jobs have been provided to the people in various departments but there are no figures available. Addressing mediapersons here after presiding over a BJP workers' meeting, Shanta said the BJP would stick to its share of 23 seats in its alliance with the SAD and clarified that nothing short of this figure would be acceptable to the BJP. On seat swapping among the alliance partners post-delimitation, he said a decision in this regard would be taken soon. On the resentment in the party cadre regarding seat swapping, he said it was “wrong to lodge protest even before a decision was made”. He said the party candidates would be decided on merit. Asked whether the sitting BJP MLAs would be allotted ticket, he said only the “best candidates” would be fielded. If you are traveling through Punjab on Sunday morning, don’t get surprised by the “friendly” cops and at some places even the executive magistrates standing on the roadsides to guide you with a handy route map for your journey. A senior official of the police claimed that measures have been taken for the safe journey of all those who are coming to attend the rally on the Moga-Ludhiana national highway and the daily commuters. As the Akali Dal has hired almost all the private buses in the state to ferry people from all over the state the daily commuters may have to adjust their journey schedule as per the timings of the Punjab Roadways and PEPSU Roadways buses. And, all those who want to pass through the Moga district on their personal vehicles would have to follow the route map; otherwise, they may get struck in the traffic jams and face harassment. The Health Department has set up mobile health care units and deployed ambulances on major routes in and around Moga district as a preventive measure. 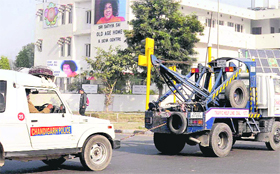 The traffic police had already started patrolling on motorcycles on the Moga-Ludhiana highway. The SAD leadership is expecting an arrival of about one lakh people tonight in the Moga district for whom all the banquet halls, hotels, gurudwaras and other public places have been reserved for a comfortable stay. A senior Congress leader has already shot a letter in this regard to the Chief Election Commissioner, highlighting how Akali workers with dubious records have been granted arms licences. "All licences issued in 2011 should be suspended for the peaceful conduct of elections," he claimed, adding that over four lakh such licences had already been issued in the state. Inquiries by The Tribune also revealed that a majority those who procured arms licences in 2011 share proximity with the ruling party as their cases were recommended by SAD leaders. "Following new rules passed to all district police chief's, no person can procure an arms licence without police verification which has made it even tougher for a non-Akali worker to get a licence," claimed a senior police officer. Following tougher guidelines issued by the Ministry of Home Affairs (MHA), the state government has authorised the police to clear an applicant only if he faces any threat from terrorists or has served at a post by virtue of which he is vulnerable to terrorist attacks. Other than licenced weapons, country-made weapons are easily being smuggled into the state from Madhya Pradesh, Uttar Pradesh and Bihar. Denying allegations, media adviser to the chief minister Harcharan Singh Bains said the government had adopted a clear and transparent manner for the allotment of arms licences. "Let the Election Commission decide on Congress' complaint," he stated. Chief election commissioner Kusumjit Sidhu said the DC and the SSP concerned were responsible for the licences they issued. Instructions had been issued to them pertaining to the procedure needed to be followed, she said. From schoolgirls to housewives, Punjab is facing a serious problem of anaemia, which is more prevalent in the women folk. With these words, Minister of State for External Affairs, Preneet Kaur, has said that she is extremely pained to notice that women in almost all the villages are having iron deficiency. After kick-starting a health awareness camp for a cluster of 7-8 villages of Shatrana assembly constituency, Preneet said that problem of anaemia in women has acquired alarming proportion but so far the SAD-BJP government has miserably failed to even take cognisance of the matter. Notably, after getting a survey of villages of Patiala done by Cancer-Aids Awareness & Prevention Society, Patiala, in collaboration with an NGO - Birds Group from New Delhi, Preneet has initiated the project, wherein treatment for routine ailments, would be provided to the needy free of cost. Striking an emotional chord with the women at the camp, Preneet personally listened to the health problems being faced by women. Speaking to The Tribune, she said, "What transpired during the survey was that from schoolgirls to women, the HB content was extremely low. Some of the reasons behind iron deficiency among the women are poor nutrition and early marriage." Preneet further said that it was unfortunate that requisite infrastructure was not in place, especially in rural areas, for providing primary health treatment. "If there is a hospital, there is no doctor and if there is a doctor, there is no equipment. These issues need to be addressed on priority", she asserted, while addressing the gathering at today's camp, where 1,000 people were examined by the doctors and given medicines free of cost. Expressing her desire to expand the project in the entire constituency of Patiala, Preneet said, "Unless and until the women folk is anaemic, the new born kids in the state would not be health." "There is no dearth of funds with the Union Government for providing healthcare. State governments are being given financial assistance under various programmes and Central schemes. Unfortunately, the present SAD-BJP government has failed to judiciously utilise the grants being released by the Union Government", said, Preneet. Taking at dig at Badals, she said, "The photographs of Badals on the ambulances, bicycles, water tanks, reflects their cheap mindset to draw political mileage out of every issue." Instructions in this regard have already issued by the Election Commission. According to it, police officials on duty on the polling day will get postal forms by their respective district cadre from where they draw their salary. The process will start soon after the printing of the election symbols and other formalities are completed. Joint chief election officer Gurkirat Kirpal Singh said forms for policemen would be dispatched well in advance to their respective districts. One of the patients Paramjeet Kaur from Baran village, who had been taking treatment from a private clinic for the past three days, said, "The doctor asked me to get few tests done and I reached the hospital, but there was no one to conduct these tests. Then, I got the tests done from a private laboratory, which charged me around Rs 600." Satwant Singh, who hails from Kalyan, said this was not the first time he had to go to a private hospital. Earlier, he came here few days back but the nurses were on strike. "Today, my son was unwell and I brought him to the hospital, but again there was no one to conduct blood test. I had to get the test done from a private lab at Leela Bhawan," he added. One of the doctors at Rajindra Hospital said while the lab technicians were on strike, the hospital must make some alternative arrangements. "Patients who come to Rajindra Hospital are not very rich and cannot afford to get the tests done at private labs. There are large number of students in Government Medical College who could help in conducting these tests," he added. The MPs, especially representing the rural areas, would act as pressure groups upon the government to initiate reforms, said national chapter President of the consortium, Satnam Singh Behru. After appearing before a local court in connection with an 11-year-old fertiliser scam case registered by the Punjab Vigilance Bureau, Behru, who is a complainant in the case, said efforts to mobilise MPs bore fruits when a five-member delegation of the consortium met Prime Minister Manmohan Singh in Delhi on December 12. The Prime Minister was handed over a 14-point memorandum that requested for immediate reforms in the agriculture sector. Based on the meeting, Union Agriculture Minister Sharad Pawar had invited the consortium members for meeting on December 19. Behru said the agriculture reforms never materialised as MPs never debated on the issue on the floor of both the Houses. "All the state units are meeting their respective MPs to convince them about the urgent need for reforms. As a result, the issue was debated by about 100 MPs in the Rajya Sabha on December 15", he said while adding that two MPs from Punjab, Preneet Kaur and Harsimrat Kaur Badal had already raised the issue in their individual capacities. While welcoming the FDI, the consortium demanded separate budget on agriculture, implementation of the Swaminathan report, decontrolling of sugar, removal of restriction on export of cotton, setting up of agriculture machinery service centre, private investment in irrigation sector, and MGNAREGA for agriculture production. From the past three years, the average annual contract of agricultural land fetches an average of Rs 38,000 per acre and with all other prices heading north, the contract is in for a dip in the state, given poor returns to the tillers. "We save roughly Rs 55,000 to 60,000 per acre per annum and after we deduct the contract amount for the landlord, we are left with peanuts, given the high labour and input costs. On an average we save Rs 8,000 to 12,000 per annum per acre", said Ranjit Singh, a farmer of Devigarh village. Another landlord Harminder Kaur, who owns 10 acres in Jogipur village, says that every year when she approaches the tillers for a hike in the annual contract, they instead request her for deduction in the annual contract fee. "This year again, they are requesting me for the same and when I calculated their expenditures, I have to agree that the condition of actual farmers is just hand to mouth", she added. Noted economist and CRRID Director Sucha Singh Gill said that till the time the farmers would be dependent on the MSP alone, it would be difficult to improve their condition. "Instead, with new techniques they should try to improve the yield by 50 percent to get a better deal as the current model of farming on paddy-wheat cycle suits only the bigger farmers and slowly pushing the marginal farmers towards bankruptcy." Gill said. Meanwhile, farmers in various blocks of Patiala, Sangrur and Fatehgarh Sahib rued, "With escalating prices of diesel, labour and fertilizers, profits are dipping every year and as majority of them are uneducated, they are not suitable for other jobs." "We have been tillers from the past three generations and know nothing else, this year the potato glut has caused losses to us beyond imagination and there is nothing we can do about it", they echoed and alleged that earlier losses by floods had already broken them financially. Punjab Mandi Board Chairman Ajmer Singh Lakhowal said that they were constantly holding dharnas and on January 5 they would be holding a nationwide protest against the anti-farmer policies of the government. "We demand that the government should do something to save our crops from high input costs and instead of the MSP, they should try to control the escalating costs of farming ingredients", he added. While most of these employees were demanding revision in pay grades and regularisation of their services along with few additional allowances, the PCMS doctors were demanding raising of retirement age of PCMS doctors on par with their colleagues working in medical colleges, cadre review including creation of specialist cadre on Central Government Health Services pattern, edge of six increments in every scale to specialist doctors, treating non-practicing allowance (NPA) as pay for all intents and purposes, re-fixation of pay by calculating the NPA on Dearness Pay (DP), restoration of status of civil surgeon on par with District Judge and Deputy Commissioner, creation of post of Director General of Health Services, designation of administrative SMOs as Deputy Civil Surgeons, and Restoration of notification to treat 'satisfactory/average' ACRs as 'good' for ACPs. Though these employees had been holding massive protests for the past one-month, all they had received till date was verbal assurance that their demands would be accepted at the earliest. Giving information, one of the senior doctors said that the government must chalk out common criteria for promotions of all state employees. "While one section is extended favours, others who are equally qualified are ignored. Just few days back on December 9, Harcharan Singh Bains, the Advisor to Chief Minister Parkash Singh Badal, had principally agreed that all demands of the PCMS doctors, except increasing age, would be accepted soon, but even after a week, there has been no notification in this regard," he added. On the other hand, Jasbir Kaur, president of the ANM and LHV Union of Punjab, said it was high time the government should give a decision over their demands. An RTI activist had alleged that the MC president, in connivance with officials and the then Naib Tehsildar, sold the prime land worth crores of rupees to unknown persons at throwaway price, causing financial loss worth crores of rupees to the MC. He alleged that MC president Gurbinder Singh Bhatti, son of local SAD MLA Didar Singh Bhatti, was one of the witnesses on papers when the then Naib Tehsildar transferred the possession of land in favour of Raja Ram and Lalit Mohan, whose addresses were not properly mentioned. NK Sayal, member, RTI Federation, Punjab, in his complaint to the Chief Minister, Financial Commissioner (R), Deputy Commissioner and other officials had alleged that as per Girdawri of 1959-60, the land was a cremation ground of village Bara, falling under Sirhind, but somehow it was converted into agricultural land and the possession was shown in the name of one Balbir Singh Nihang from the past many years, while the ownership remained with the MC in Girdawri. He alleged that on October 28, 2009 the then Naib Tehsildar Manmohan Sharma changed the possession of the land from Balbir Singh to Raja Ram and Lalit Mohan, residents of Gobindgarh, without mentioning their proper address. Moreover, the Naib Tehsildar mentioned that the possession had been changed in presence of one Harjit Singh Nambardar, whereas there exists no nambardar named Harjit Singh in village Bara. Interestingly, the MC sold this land to Raja Ram and Lalit Mohan through auction on March 17, 2010. After getting the land in auction, Raja Ram and Lalit Mohan wrote a letter on April 2, 2010 to Executive Officer of the MC to make payment and to register the land in their names and they mentioned their address as residents of Amloh instead of Gobindgarh. The land was registered in their names on April 5, 2010 for Rs 1.13 crore. Deputy Commissioner Yashveer Mahajan said that he got an inquiry done by the District Revenue Officer (DRO) and the DTO and he had sent the report to the Principal Secretary (Local Government) for necessary action. He admitted that certain irregularities were found, so he recommended that in-depth probe should be conducted by the Local Government Department. However, Gurbinder Singh Bhatti denied all these allegations. He said that properties of the MC were sold as per the government policy and by adopting proper procedure and the Deputy Director conducted the auction. He said development works worth Rs 4 crore were initiated and completed with the income from of those properties.